You'll be £15.99 closer to your next £10.00 credit when you purchase Britain’s Desert War in Egypt and Libya 1940–1942. What's this? The desert war in Libya and Egypt between 1940 and 1942 has deservedly attracted the attention of many historians. Fought in an unforgiving yet strategically important landscape, the fortunes of the implacable opponents swung wildly. While best remembered for the duel between Montgomery’s Eighth Army and Rommel’s Afrika Korps and the iconic battle of El Alamein, this fine account describes that there was much more to the story than that. In addition to the role of Imperial and Italian troops, the cast of characters included the controversial Auchinleck, the long-suffering Alexander and many other gifted commanders. Gazala, Bir Hakeim, Alam Halfa and Tobruk battles were among the many fiercely fought battles. The two sides employed weapons that have passed into immortality; Germany’s Tiger and Panther tanks and lethal 88mm anti-tank gun. The Messerschmitt BF109 fighter locked horns with desert-modified Spitfires and Hurricanes. The author highlights the vital roles of the Royal Navy, disrupting enemy supplies, and the Royal Air Force, which eventually gained command of the air. For a concise account of this decisive campaign, David Braddock’s authoritative yet highly readable history is unlikely to be surpassed. David Braddock was educated at Dartford Grammar School in Kent and attended Birmingham University gaining a 1st Class Honours Degree (BA) and in 1950 became a Research Scholar. In 1953 he joined the Royal Air Force in 1953 as an Education Officer. Retiring in 1958 he joined the University of Southampton’s Adult Education Department. Before retiring, he worked for the British Army preparing officers for the Staff College entrance examination. Among those he taught was General Sir Nick Carter KCB, CBE, DSO, the current Chief of the Defence Staff, who has written the Foreword to the 2019 edition of Britain’s Desert War in Egypt and Libya 1940–1942. 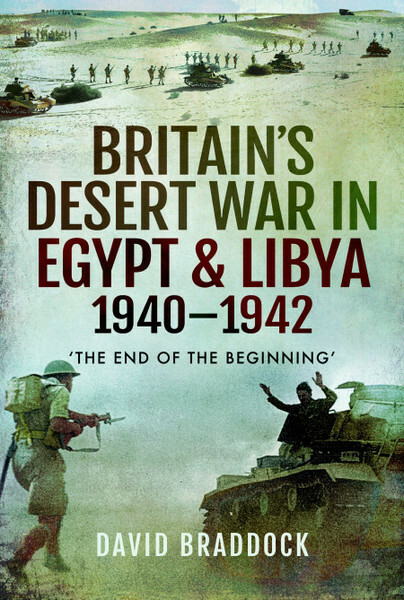 Britain’s Desert War in Egypt and Libya 1940–1942 was originally published in 1964 as The Campaigns in Egypt & Libya 1940-1942. In 2011 David was awarded the MBE for 40 years of voluntary service supporting educational development in Dorset. He lives near Weymouth.